The holidays are here, and for us, that means parties, dinners, and get-togethers whether at home or across the country. In addition, it also means extra cleaning, new decorations around the house and maybe seasonal candles or air fresheners. From a pet’s point of view, all of the holiday festivities can seem stressful because of the change of pace, new sights and sounds, and new people intruding in their home. One of the biggest factors that may cause your pet to stress out is the change in routine. Pets thrive on routines because they know what to expect and when to expect it. For some pets, a simple, sudden change in feeding time can heighten their anxiety levels. The best thing you can do for your pet during the holidays is to stick to their normal routine as best as possible. For example, make it a goal to keep meals, walks, and playtime happening at the same time each day. Keeping your pet exercised can help them release any pent-up energy that could result in hyperactivity and anxiety. Mental exercise can be just as important as physical. Give your pet food puzzle toys to keep them occupied. If guests are coming over for holiday festivities, it might be best to give your pet a quiet space and provide your pet a room, gated area, or crate to keep them safe. For pets that might have higher stress levels, would greatly benefit from calming supplements, such as Calming Aid Soft Chews. Calming Aid Soft Chews is a tasty supplement for both dogs and cats that helps provide support and comfort during times of high stress and anxiety. These soft chews are perfect for use during the festivities of the holidays, as well as storms, travel, fireworks, grooming, vet appointments, and more! Each chicken liver-flavored soft chew contains chamomile and thiamine, both of which work together to help alleviate anxiety in stress-inducing situations. 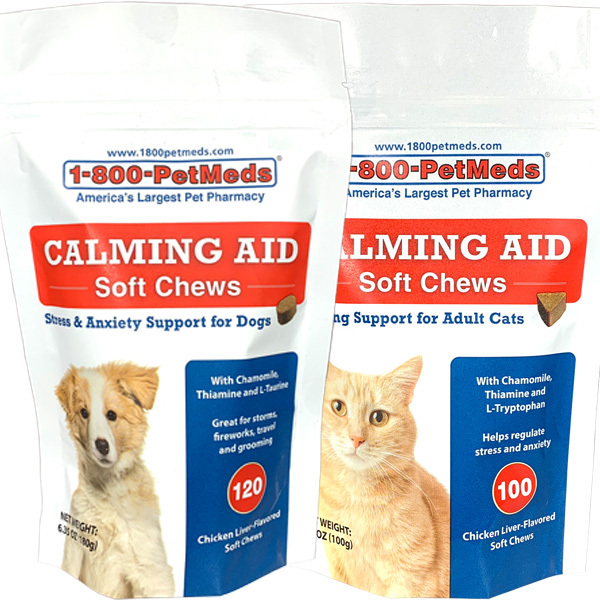 Calming Aid Soft Chews for Dogs (18 weeks and older) is available in a 120 count bag, and Calming Aid Soft Chews for Cats (12 weeks and older) is available in a 10 count bag. Win FREE Calming Aid Soft Chews for Dogs or Cats! Keeping your pets calm during the holidays might be tough. Help calm them down with Calming Aid Soft Chews! 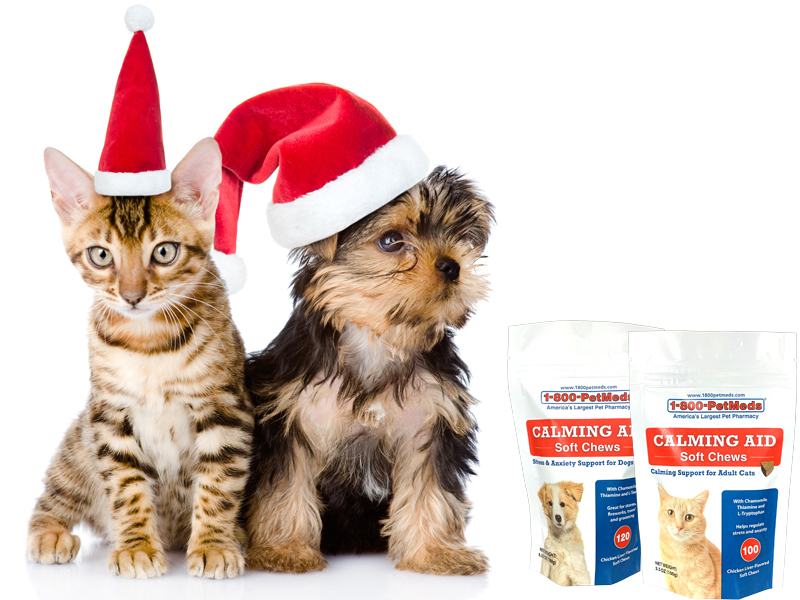 Just leave a comment below, and you could win FREE Calming Aid Soft Chews for Dogs or Cats from 1800PetMeds! Six winners will be chosen at random Monday, December 3, 2018, so everyone who participates has a chance to win! There will be a total of six (6) winners. (Limited to residents of the U.S.) Good luck! Congrats to the drawing winners; we’ll send an email about claiming your prize. There are wooods behind my house and brought in 2 feral cats. The 3rd feral was brought in approximately a month ago I brought in a feral and he hasn’t quite learned about litter boxes. I don’t know what he does during the day butI know what he does often at night. When I’m asleep thinks I am a litter box. Needless to say it isn’t acceptable to me. During the day he follows me everywhere and when I sit down he is on my lap with his head on my shoulder purring. I don’t know if maybe he just wants me to be with him I’m hoping the calming aid will be what he needs. Now for the second cat. He is a gorgeous Balinese but he runs away if you just look at him or walk into the room. I have never held him. I’m also hoping the calming aid will help him. My dog Shadow, has travel anxiety. We go to visit my son in Indiana and my daughter in Iowa about 6 times a years and I always take Shadow with me. The vet prescribed Xanax for his travel anxiety but I hate to drug him and it really is not too effective (I only give the lowest dose prescribed, hesitant to give the higher dose). I think the chews might be worth a try, they seem safer than Xanax to me. Fireworks are a cultural tradition in Hawaii. Every New Year Day is a distressing day for Tabby. I have tried tranquilizers but it is sad to see him drugged. These chews may be the solution to his holiday anxiety. My dog is having anxiety in the car and I am hoping these chews will help. Hope these will help on a long upcoming move and change of scenery for my Jack whom is a rescue and has had terrible anxiety since I adopted him. I would love to try this product on my long trip with my three cats in the car, they are anxious about the car as I am with the trip. I’ve tried many products, but maybe this is the one I’ve been waiting for. Hope I win the chance to try it! My nervous cat could use this over the holidays when visitors are here! My son is staying with me and he has two cats! One wakes me up at 4:00 am each day so I am truly looking for something to help her and let me sleep too! We have a Siberian husky & we had a bad storm one day when we weren’t home & ever since that day she doesn’t like storms & gets agitated when it thunders or she sees lightning. We now live in the woods & when she hears a gun go off she also gets agitated. I’ve been trying to find something that will help her. We also have two cats that run away when someone new comes in the house. Maybe these are the answer! My sister has a dog that could use these during thunderstorms. She has tried everything else out on the market and the dog still shakes really bad. My animals sleep through storms but this would make a nice Christmas present for her dog! I have a rescue dog with PTSD. He jumps at every loud sound and there is lots of construction and aircraft noise since we live near a military base. I am looking for something other than meds to help him deal with the noise. I don’t see my comment, so I’m trying again. I would love to try these for my dogs with Firecracker anxiety. Thanks! These would be great for my Nana girl. She is so very anxious all day. My lab Colby has become a bundle of nerves and anxieties lately and I think much of it was due to the company and hustle of Thanksgiving so I can’t imagine what Christmas might bring. He is scared to walk across the floor, to go up the stairs, to enter through the screen door. I am not finding good solutions. He could definitely get some use out of this product. Would love to give it a try. Mimi seems to be anxious when I take her to the groomer or vet. Even though she likes the groomer and settles down eventually, she pants when she gets in the car until we arrive at our destination. She is also very finicky so not sure she would even eat the chews but would like to try.